There is a bridge you must cross. It is a bridge that will take you from where you are to where you want to be in your life. Doing what it takes to cross the bridge is a journey filled with doubt, fear and the uncertainty of the unknown. The crossing is challenging and sometimes daunting but ultimately worth the rewards that await you on the other side. The bridge is the pathway for life transitions to occur. It is also a connector, bringing two things on opposite ends together. On the bridge you are simultaneously moving in two directions; moving away from one thing (life as you know it) and moving towards another (life as you imagine). Stepping on the bridge to get to the other side; takes you through a whirlwind of emotions one of which is fear. Fear is powerful in that it can help to take you where you want to go. It can become the fuel for your dreams, a springboard of sorts that propels you into action. But it’s power is also equal in its ability to paralyze you, to stop you in your tracks. To stop you before you can even get started. 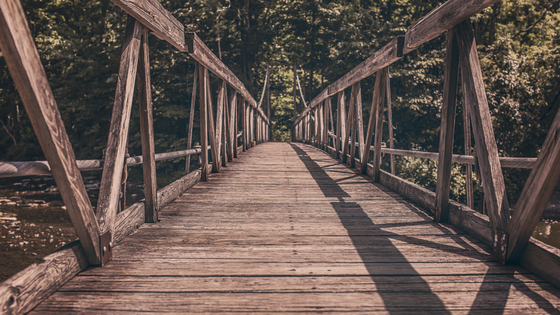 Paralysis keeps you standing at the foot of the bridge sometimes for days, months or years longingly looking over at the other side, but unable to move towards the life you desire. And when fear is at its strongest, you no longer stand at the foot of the bridge but instead turn around and walk away from the bridge altogether going back to the life you were trying to leave. For a long time, I stood at the foot of the bridge longingly gazing over at the other side. Fear kept me firmly planted there. I was plagued by the idea that I did not know how to cross over. All the ways I thought I could get across the bridge were trumped by overwhelming doubts, fears and what I deemed as legitimate concerns (that I could back up with actual data). I could see what I wanted. I could see myself being self-employed. I could see having more time to spend with my children. I could see creating a business that would make a difference in the lives of others. I could see myself becoming financially stable and independent. I could see it all on the other side. But I could also see all the obstacles, challenges, what if’s, potential failures… the list goes on and on. Then there were other times when I stood at the bridge and thought about how to get across in a way that was akin to a sprint. I wanted to get over to the other side fast because I knew how much time and how many years I had already wasted doing nothing but standing there. I felt if I was going to finally go to the other side, I wanted it to happen quickly. I didn’t want to wait or waste another minute. Everything that I had spent years envisioning, once I crossed over it would magically appear. I had created in my mind an unrealistic scenario that bypassed all the hard things that it took to walk across the bridge. So either I was plagued by fear and limiting beliefs. Or I was energized by unrealistic pie in the sky expectations. A middle ground seemingly non-existent. What I eventually came to understand is that going to the other side is a mind thing. It is about the thoughts you feed your mind. I was feeding my mind with beliefs that told me why I could not have what I wanted. I fed my mind with beliefs that limited me. My beliefs were stuck on repeat. One, in particular, was this idea that I could not pursue my dreams because I had children and I needed to be in a job that provided security. I convinced myself that any dreams of self-employment as a writer had to be put on hold until my kids were out of the house. Faith- believing in God and in yourself. Changing your mindset from can’t to can. Vision- being able to see clearly the dream and life you imagine as becoming yours. A Plan- action steps to take in order to make your dreams your reality. These are the three essentials I took with me when I left the foot of the bridge and actually stepped on to it. When you move from standing at the bridge to actually placing your foot on the bridge, you are at the beginning of the journey. I stepped onto the bridge the day I decided to start making choices that fit with what I wanted for my life. I made up my mind and acted by taking small and steady steps. One of the first things I did was purchase my domain name wordsbytara.com to begin sharing my writing. The middle part of the journey is the consistent daily walk you take across the bridge. It is where transition and transformation occurs. The middle of the crossing has its highs and lows which are the testing grounds for your faith. The struggles, disappointments, and setbacks on the bridge can determine your willingness and commitment to push through to the life you want. There will also be big and small successes along the way. But it is in the middle where opportunities are plentiful for learning more about who you are and what you are made of. Reaching the other side is the end of the journey though it never really ends because you will always continue to grow and change. There will always be new opportunities to stretch you and challenge you as you become the best version of your true self. There will always be new bridges to cross and in the process of walking, your faith muscles are built up, your sense of self-worth will continue to rise and fear no longer will paralyze you but instead becomes a welcomed part of the journey. On the bridge will you have missteps? Will you fall down? Will you wonder if you are ever going to make it across? The crossing is not easy, but going to the other side is definitely worth it because you matter, your ideas matter and your dreams matter. Where are you on the bridge? Are you at the foot of the bridge? Are you walking across the bridge? Or have you made it to the other side and are now ready to cross a new bridge? I would love to hear from you. Send me an email or post a comment. Learn more about what it is like for me as I am walking across the bridge in my new podcast series. This series will be comprised of eight episodes where I take you behind the scenes of what it is like to be a Dream Maker. Join me as I share my journey in becoming a successful, self-employed writer who uses her words to make a positive difference in the lives of women. Sign up for the wordsbytara.com Weekly which includes ideas, information, and inspiration to empower you to pursue your dreams and create the life you envision.